24 AWG Hyper Grade Cat5e Stranded Patch Cable, suitable for 100Mbps and Gigabit Networks. Stranded cores give the strength and flexibility required for creating patch cables. The outer sheath is made from a LSZH material meaning that it can be used in public building installs. This cable is packaged in a fast feed box to reduce snag when working with it. When makinging your patch leads we recommend using the correct RJ45 connectors for the cable. When using stranded cable you should also use stranded plugs. Always test your patch cables, a cable may work when not correctly crimped but will not support 100Mbps or Gigabit networks. Choosing the correct cable for the network you are installing is very important if you get it wrong the system may not beas required. We have answered some for the common questions below. What is LSZH and why is it normally more expensive than PVC Cable? LSZH stands for Low Smoke Zero Halogen and can also been known as LSOH. Low smoke cable can be a legal requirment in some installs as unlike PVC cable if burnt the cable does not emit posiouns Halogens. Low smoke cable should be used on public place installs incase of fire. What is the difference between solid or stranded core cable? Stranded CAT5e Cable has 8 inditidual cables twisted into 4 pairs. The Cable within each of the 8 wires is made from multiple smaller gauge wires also known as strands, these strands at bound together and protected by an outer jacket which is colour coded for ease of installation. Because of the smaller strands within the jacket this type of cable very flexible, and therefore popular for creating network cables with lots of bends or cables which have to be moved a couple of times. For cables that cover long distences it is recommended to use solid cable. 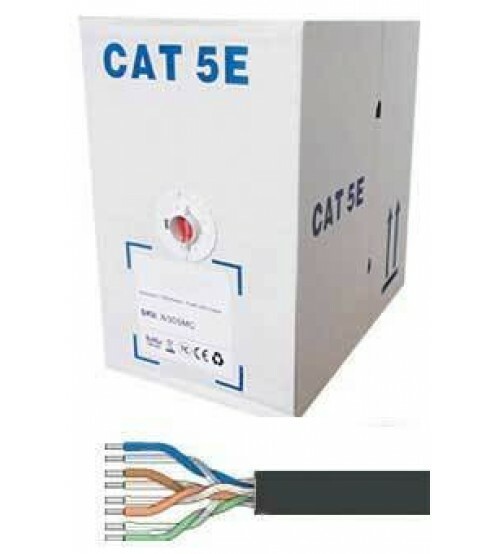 Solid CAT5e Cable is a 4 pair network cable as well. The cable each of the 8 wires is made from a solid piece of copper wire covered with a jacket normally made for PVC and color coded for installation. As this each wir4e is made from one copper wire the cable is more likely to get damaged when bending or moving, but this type of cable is able to carry a much stronger signal than stranded wire.